You know Perry loves his sleep and his epically long afternoon naps are a wonderful thing for him, and his parents. Well nap time at preschool, affectionately called "happy nappy," is not quite so long and in a room full of other children...a far cry from alone in his crib in a dark room with black out curtains. So I think he has been averaging 1-1.5 hours of nap on days he is at preschool. And most days I think he has been waking up from nap on the "wrong side of the nap mat." Those couple hours post nap and before pick up have been a little rough. Hopefully after the first couple of weeks he will get more accustomed to his new routine and he will wake up happy from his happy nappy. Yesterday afternoon he was all manner of upset at the world when I got there to pick him up. But it was nothing a little chicken and waffle fries couldn't fix. 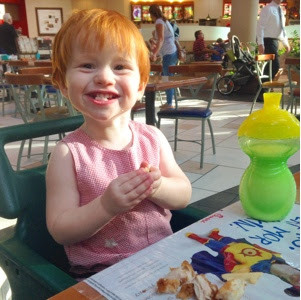 It was family night at the mall Chicfila so we went and grabbed a quick bite to eat before getting to work on some baby shower prep at home. The previous day he was also not a happy camper late afternoon after not getting too much nap. I sure thought he would be out cold by the time we drove over the mountain, but he didn't. 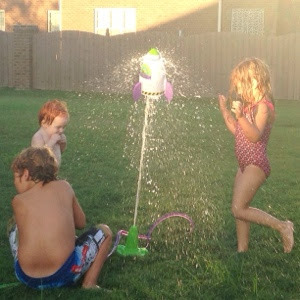 Instead we went over to the Eckleys for dinner and the kids had a literal "blast" playing in the sprinkler. Ben and Kate were quick to show Perry the ropes in how fun sprinklers can be. They played and played until we forced them to come inside. Perry had long forgotten about being tired...too much fun to be had with his big cousins that he loves so much. I would have loved to have captured on video his reaction when we walked into their house Wednesday evening. He strutted right in and immediately started calling for "Matt...where's Matt" (who was upstairs with Ben and Kate). Then when the bunch of them came down stairs and P saw them coming he started jumping up and down in the kitchen and waving his hands around out of excitement. He could not contain himself. It was so precious and we laughed so hard. So despite a few rough late afternoon hours here and there, we have had a good week.